Yannick Lebrun’s story, of a twenty-four year old native of French Guiana turned world-traveling Alvin Ailey dancer, is rooted in humble beginnings. His leap from studying dance at the Adaclam School in Cayenne (capital city of French Guiana) to carving out a place for himself in the award-winning Alvin Ailey American Dance Theater is not a path frequently travelled. “For those from French Guiana…the possibilities for dance are few and far between,” he says. When he starts talking about his journey, he exudes an admirable and effortless humility. However, that humility belies the success of his still-emerging career. Since officially moving to New York City in 2004, Lebrun’s tenure at Ailey has evolved from aspiring fellowship student, to rising dancer of Ailey II, the company’s ensemble of young talent, to one of the thirty professionals of the current Ailey troupe. Lebrun’s journey is equally matched with an impressive body language. He clocks in rave reviews from the New York Times, The Star Ledger, and more recently ALEIM magazine’s Victoria Foster who writes that when it comes to his repertoire of movement, Lebrun can transform “suddenly into an insect, a machine, a bird taking flight, a shaman leading an ancient tribal mating dance, or a spaceman attempting communication in some ritualistic nonverbal language of the future.” He credits this versatility to his early beginnings. “Growing up in South America influenced me as a dancer because I was surrounded by different cultures and ethnicities. All of those varied influences broadened my dance vocabulary and I became a more versatile dancer because of it,” he says. On December 1, Lebrun joins the Ailey dancers in the world premiere of “Home,” an evocative piece inspired by stories of people living with or affected by HIV. Created by hip-hop choreographer Rennie Harris, the new work is choreographed to a hybrid score of gospel and house music—vibrant, rowdy, loud, energetic, and celebratory! It’s a counter-intuitive choice of sorts. What you won’t hear is a soundtrack suitable for candlelight vigils. The score and choreography are perhaps a statement in itself—one that boldly confronts the culture of silence that continues to permeate the disease. “Home” is not aiming for sentimentality. Instead, the work seems to be after motivating action. In the mid to late 1990s, the incidence of AIDS in French Guiana was among one of the highest in South America and the Caribbean. Although current rates have declined, the global health community is calling for renewed focus on the Guiana region as a whole, which include neighboring countries Suriname (formerly Dutch Guiana), and Guyana (formerly British Guiana). For Lebrun, “Home” translates across borders, including his own, and across the work’s particular subject of HIV/AIDS. He believes, “Home” tells a universal story of grief and overcoming grief.” As he prepares to plot another mark in his professional arc, he shares how his French Guiana beginnings have influenced his role as a dancer and the responsibilities of the Ailey troupe in using dance as a tool to champion this critical social issue. How has growing up in French Guiana influenced or inspired your career in dance? Growing up in South America influenced me as a dancer because I was surrounded by different cultures and ethnicities and all of those varied influences broadened my dance vocabulary and I became a more versatile dancer because of it. My dance teacher Jeanine Verin (from Cayenne) inspired me to become the dancer that I am now. She taught me not only dance techniques, but how to be passionate about what I do and to never take a moment on the stage for granted. Thanks to her, I’ve been able to work with different instructors in France and take part in various summer programs like when I was 14 and came to New York for the first time to attend The Ailey School’s Summer Intensive Program. Are there many dancers coming out of French Guiana? How is your place in Ailey as a native of French Guiana significant? I’m happy to say that since I started my journey with the Ailey organization over 10 years ago, many dancers from French Guiana have told me that I inspired them to become a professional dancer and that seeing me rise to the place I am now in the company, gave them hope and encouraged them to leave French Guiana and study at The Ailey School, just like I did. They told me that they couldn’t believe a dancer who came from the relatively small country of French Guiana like them, could experience as much success as I have. Many of them thought a career in dance wasn’t practical, but after seeing me, they’ve realized that dreams do come true, even for those from French Guiana where the possibilities for dance are few and far between. At first, I wasn’t aware of the impact my personal journey had on those young dancers, but overtime I realized that they were watching me and aspiring to follow in my footsteps and it made me feel very honored. I am the only French citizen in the company and I not only represent French Guiana and all of South America, but I also represent France. I feel as though I am a French Guianese Ambassador when I travel around the world with the company. I’m honored to wear both hats. When you’re in the moments of “Home,” in its movements, its score, its message, what does it mean to you? The Alvin Ailey American Dance Theater is, in a impactful way, part of the fight for HIV and AIDS awareness. Through hip hop, we can express how we feel about this issue and the disease. When I’m dancing the piece, I feel like I’m a reflection of all of those who have lost friends and family members due to this disease. I feel empowered, like I have an important voice that is being translated through the dance. How can dance be used to tell the kinds of stories that “Home” is endeavoring to tell? I think “Home” tells a universal story of grief and overcoming grief. It speaks to everyone. There are no boundaries that keep any particular demographic from understanding and deeply feeling this piece. 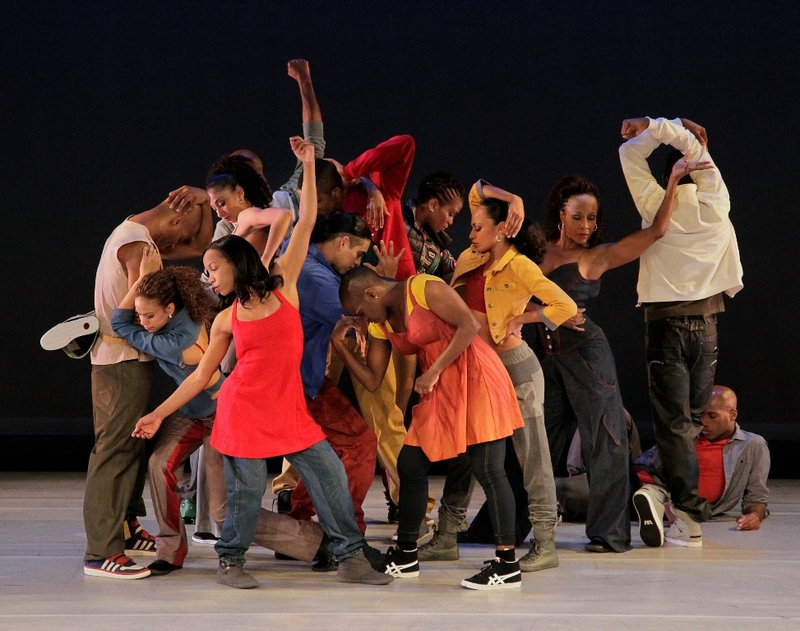 Why is “Home” is an important or needed piece for Ailey to do? It’s especially important for us to join the fight for awareness because our founder Alvin Ailey died of AIDS on December 1, 1989. Then, it was taboo to say you were infected, and it was a very closeted issue. It’s becoming increasingly important to open our minds, and not be afraid to stand up for HIV and AIDS prevention and be vocal supporters of those living with the disease. Of Note Magazine is a sponsored organization of Artspire, a program of the New York Foundation for the Arts, a 501 (c) (3), tax-exempt organization. All donations are 100% tax-deductible to the full extent of the law.